It's been a long drawn out affair, but finally in the last week all 15 King's Lynn based Enviro 400s have been in operation on the X1 route. The two loan Geminis which were helping during the crisis in October were last used on 24th October (36169) and 3rd November (36190). Enviro 33821 which arrived to assist at King's Lynn on October 12th is, however, still on loan and has worked on pretty much a daily basis since its arrival. It is noticeable by the lack of X1 branding and route itinerary compared to 33803 - 33817, see picture below. The continued loan of 33821 has been to cover for vehicles away for gearbox attention, engine problems and bodywork repairs. The highest mileage bus 33812 nearly came out on top again, only beaten by 33804. 33812 has now travelled 362,126 miles since new just over three years ago. At the other end of the scale the vastly reduced accumulations for 33814/15 reflect the long periods out of traffic this year. 33803 remains the lowest mileage of the Lynn fleet at 305,381. Loan bus 33821 has only amassed 287,204 due to its normal use on the shorter journeys at the eastern end of the route. Since the 20th December there has been an opportunity to see three of the fleet without any advertisement boards and only three buses still have boards on both sides, this is thought to be due to an industrial dispute. The last week has seen services during the middle of the day at times of Christmas peak traffic being diverted via Wisbech St. Mary not serving Wisbech Tesco and Weasenham Lane stops. During a comfortable journey on 33804 on 17th December I noticed a blip on the scrolling information screen upstairs. After we passed Eau Brink eastbound, the display said the next stop was Dereham Sandy Lane for a couple of minutes before reverting to the correct South Gates stop ! Malcolm Hicks reports that the ex-Leeds Geminis are becoming increasingly common on the Eastern section now, while on 9th December 30900 came into Lowestoft on the 09.15 from Norwich. Last night (Wednesday) loan Geminis 36180 and 36172 are seen here at King's Lynn after finishing their duties. Today they were both due for safety services and as King's Lynn no longer stock a comprehensive range of parts and materials for Geminis, they were required back at Norwich. This morning 36180 worked diagram 6013 commencing with the 07.10 Wisbech - Norwich and 36172 went out on diagram 6007 which starts as the 07.23 Dereham - Peterborough. The vehicle for this turn in reality runs light (empty) from King's Lynn garage at 06.30 to Dereham. The 06.45 Norwich - Dereham X1 which arrives at 07.18 is worked by a Norwich bus and passengers for destinations westbound have to change to catch the 07.23. During the day the opportunity was taken during layover times at Norwich to swap 36180 for 36190 and similarly 36172 was replaced by blue liveried 36169, so tonight we have two new loan buses at King's Lynn seen below accompanied by the other loanee, Enviro 33821. 33815 which was returned to King's Lynn with a replacement engine yesterday was utilised today on diagram 6004 07.04 King's Lynn - Peterborough etc. Meanwhile 33816 has gone back to Cummins for...... a replacement engine, believed to be its third in its short life so far ! 33813 has now returned from receiving a new back axle, but 33810 has gone the other way for the same treatment. 33814 remains at Full Circle receiving bodywork repairs. A close eye is being kept on 33811 which has had gearbox problems - yesterday it lost 30 minutes on its last run in from Norwich and 33805 is also misbehaving in this department. I hope to bring you better news before long, but in the meantime catch one of the loan Geminis if you can, although they are limited to a lower top speed, they do have wi-fi and leather seats. The crisis affecting X1 Enviro availability has worsened since my report on Tuesday. 33821 has arrived to replace broken 33816 which had expired at Wisbech at 12.00 on Tuesday and when 33812 was taken off the road last night with an electrical fault, it meant insufficient vehicles were available at King's Lynn to complete today's run out allocation. The 08.27 Swaffham - Peterborough and return working were cancelled and Gemini 36172 was hastily appropriated from Norwich to run as the 14.00 to Peterborough see picture below. This means that 33812-816 inclusive were unavailable this morning and 36180 + 33821 continue to deputise. 33816 is due to leave for repairs on Monday when 33815 is scheduled to return with its second new engine, the last one having lasted a mere 12 months. The gruelling work on the X1 compared to town and city work more usually allocated to Enviros seems to be taking its toll at the moment. In some rather bright conditions, 36172 enters Walton Highway as the 14.00 Norwich - Peterborough this afternoon. Tuesday 11th October 2016 ~ At Last Something Different. 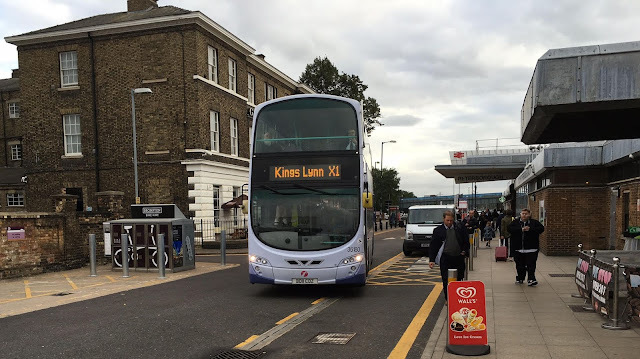 The last post here was on 21st August and the following day, Monday 22nd, all fifteen King's Lynn based Enviro 400s were used on the X1 service. This availability has not occurred again since then. 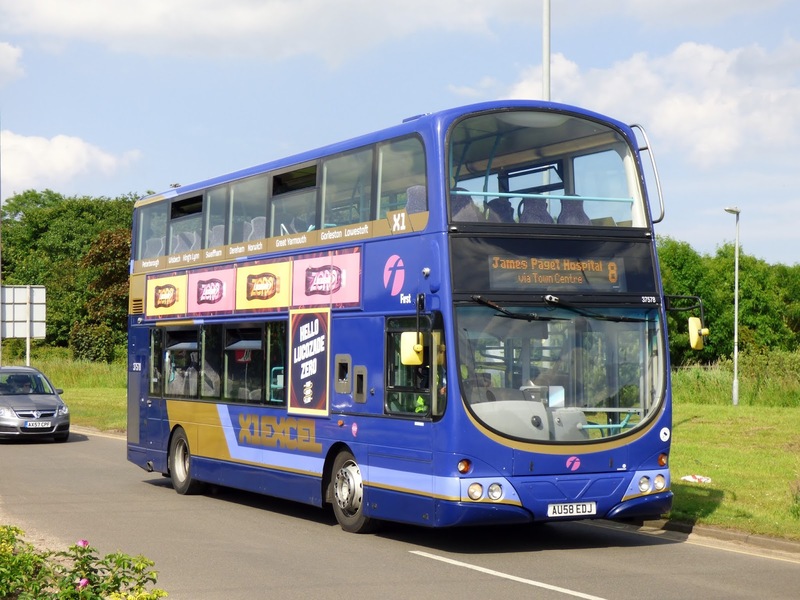 We had our annual trip to Peterborough Beer Festival on Saturday 27th August, our bus to take us there was 33817 and this performed well, however, on its way back to Norwich its gearbox failed at Wendling meaning a period out of service until 9th September. Before it returned to traffic, 33814 was involved in a collision on 6th September. 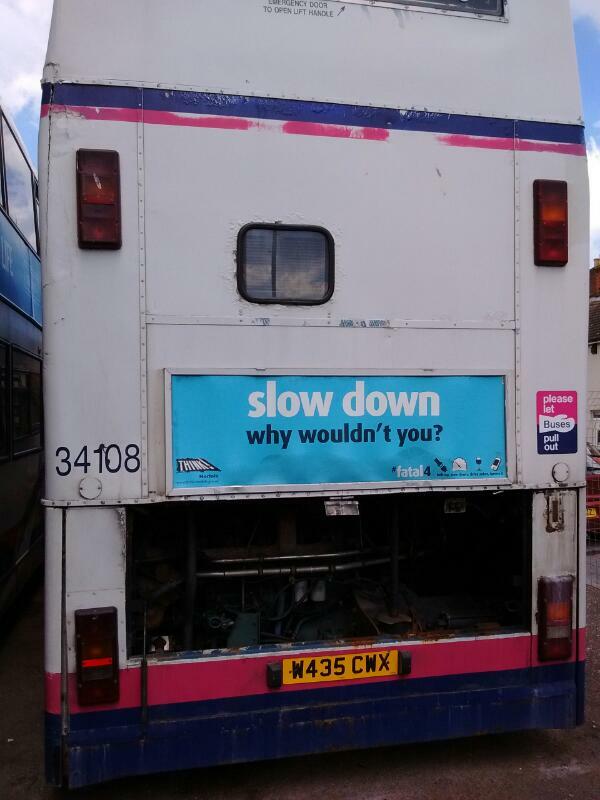 Shortly after leaving King's Lynn for Peterborough working the 08.35 service, a vehicle careered into the front of the bus near Eau Brink causing considerable damage. 33810 resumed the diagram with the 11.28 Lynn to Norwich. This left a three day period with no spare bus in the vicinity, but fortunately everything else behaved. 33814 is currently still away at Full Circle having major repairs done. The end of September saw 33815 taken out of service on 28th requiring a replacement engine and the following day 33806 was diagnosed needing a cylinder head replacement. As a result Gemini 36170 was summoned from Norwich. On 29th it worked diagram 6002 which in detail is the 06.04 Lynn - Peterborough, 07.30 Peterborough - Norwich and 11.00 return continuing with the 14.15 Peterborough - Norwich and 17.40 Norwich - King's Lynn. This is most unusual as these days normally one of Lowestoft's Enviro 400s comes over on loan to fill the breach. Next day 36170 worked the same diagram until arriving in Norwich at 10.40, whereupon it was swapped for 36180. Since then 36180 has been out daily (except Sundays) deputising for an Enviro. 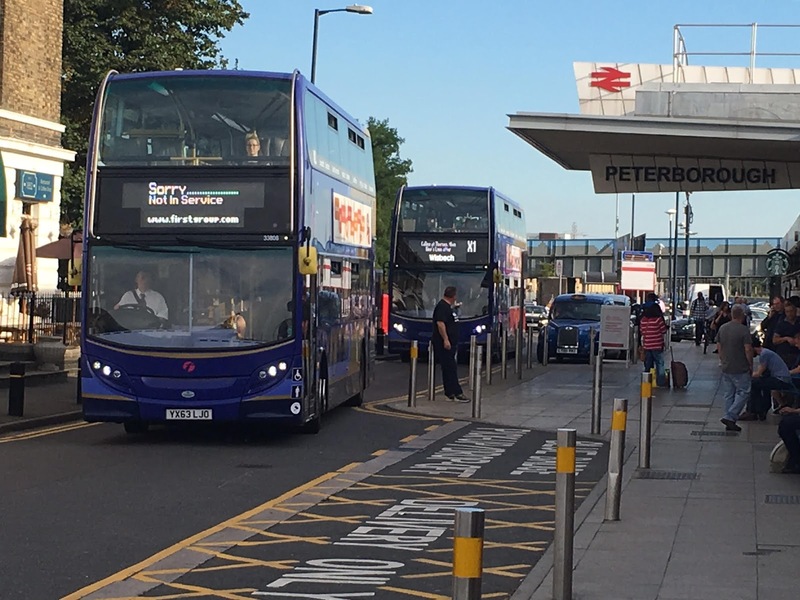 The past few weeks has seen an easing of traffic conditions on the route, with seemingly less congestion in the Peterborough area in the mornings. Another persistent problem until recently has been the late running of the 08.25 Norwich - Peterborough, caused by it being delayed at the Norwich end at peak time. This has meant that the 07.45 ex Norwich, which is usually on time has been leaving Wisbech punctually at 10.14 and then the following 08.25 ex Norwich has seen delays of up to 30 minutes meaning that it has been well after its scheduled 10.54 departure. for example 11.13 on 24th August, 11.16 on September 13 leaving a gap in the service of, in some cases, over an hour. Peter says he'd long hoped for a picture like this ! On 23rd August, 33808 and 33807 arrive at Peterborough rail station simultaneously on the delayed 17.20 & 17.55 services to Norwich and King's Lynn respectively. Victor M says "For goodness sake - now we are going via Whittlesea !" Well he's never happy of course. Another correspondent remarks that even by using this route, services are usually on time into Peterborough. So there Victor ! Another route into the city used recently was via Eye village. Spot the odd one out ? 36180 reminding us of how X1 buses used to be. 36180 arrives at Peterborough rail station forming the 16.45 to King's Lynn on Thursday 6th October. Photo by Peter. 33816 has now joined the queue of vehicles off the road after an injector failed today (11th October), 33821 is due to be used to cover. Sometimes it is a job to know where to start having not written an entry here for some considerable time. If anything, the major news concerns the sheer volume of non bus related incidents on the A47 which have conspired to make the X1 operators days extremely trying ones. Seldom has a day gone by without delays accumulating due to roadworks, accidents, road closures etc etc. It certainly seems to have been worse than in previous summers, but maybe we have had a sustained period of better weather in July and so far in August in comparison to recent years. A warm spell always brings out extra day trippers to add to the already clogged roads. Rather than trawl through the individual incidents, I will make this a catch up blog. My decorating at home is nearly complete now and I, at last, should get more time after 16 months of chaos at home, during which time it has been a wonder any blog entries appeared at all. I ought to apologise also to those who keep me updated with news and events, I have not kept up with this and will try and do better. Diversions via Wisbech St. Mary have been commonplace in the last couple of months and also X1s can regularly be spotted taking Northside from Thorney to Whittlesey to avoid delays in the Peterborough area. 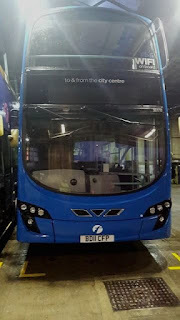 On the vehicle front, the current fleet of Enviro 400s on the western section have been fairly reliable, save a few instances of gearbox problems and oil cooler failures. With MOTs now complete, there is a little more margin for error, although a backlog of bodywork repairs are now being tackled by Full Circle. 33803 21st May - 15th June : Engine failure, 26th June - 14th July : rear axle. 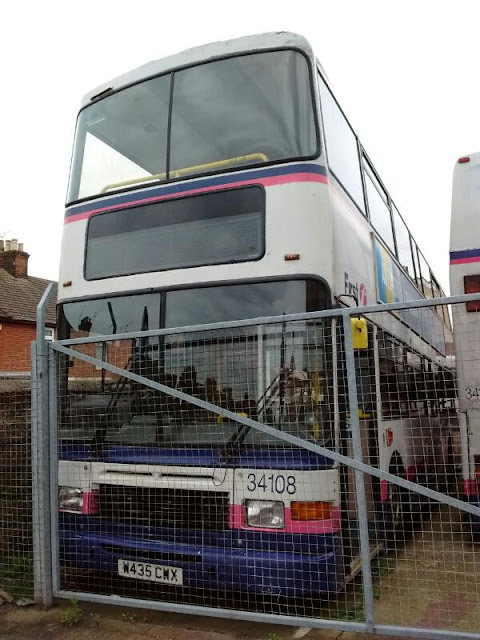 To help out Yarmouth's 33823 had an extended period on loan to King's Lynn from April 25th until July 12th. 33823 seen at King's Lynn garage four days before its long loan spell ended. Photo taken by kind permission of First Group. Going back briefly to early June and Malcolm Hicks says on 7th unusual sightings were heritage liveried VA 479 on 1000 X1 Lowestoft to Yarmouth , 36172 1000 X2 to Norwich, 47506 1015 to Martham 1, 32348 1040 X22 to Norwich , 66112 1430 to Norwich X2 & 8 (30888) on 1440 to Oulton Broad 106. In this connection, Zak Nelson sent some photographs of the heritage vehicles working the X1 and X11 during a bus shortage in June. Moving forward to the last week and it was another very difficult time with road conditions responsible for many late running buses and even cancellations due to driver displacement. Fortunately the Enviro 400s have been improved in reliability lately and at least this has helped the situation. 33809 did fail near Hockering last Sunday (14th) on the penultimate turn from Norwich to Lynn - 33810 went to the rescue, but 33809 which had the oil cooler fault was fixed and out next day. Tuesday was the only weekday when there wasn't considerable disruption to diagrams, but the last two days (Sat and today) have gone very smoothly. Maximum lateness recorded on Saturday was 16 minutes after the 14.11 King's Lynn - Norwich with 33809 had to visit Vancouver Avenue garage before continuing eastbound. It returned from Norwich exactly on time. Monday May 30th 2016 : Whatever Happened to...... ? Thanks to Roy for that and more from him later. No sooner had I published the last blog on 4th April than the 21.40 Peterborough - King's Lynn broke down at Tilney with 33815 ailing. A bus was sent to collect the few passengers. Jamie says "I knew it wouldn't be too long but as Christine was waiting at South Gates for me, I phoned her to collect me and got home marginally quicker". 33815 was viewed by Louise being towed into Vancouver Avenue at 01.30 by a recovery vehicle, it being another victim of the gearbox problem. Louise herself having been 'repaired' at A & E ! The 4th was also marred by a fatal accident at Scarning involving an artic and a motorcycle which saw the A47 closed at this point from 09.30 - 18.00. Tuesday 5th passed relatively without incident which was just as well as there were no spare vehicles at the western end at all. This despite 33818 still being on loan from Lowestoft. Traffic was pretty much brought to a stand between Eye and Guyhirn for a while at lunchtime and the 10.35 ex Peterborough was 23 late into Wisbech with 33806. Later the 12.05 was seen arriving 45 minutes late with 33817 before punctuality improved. 33809's MOT was brought forward to Wednesday 6th and it was soon back on the road. 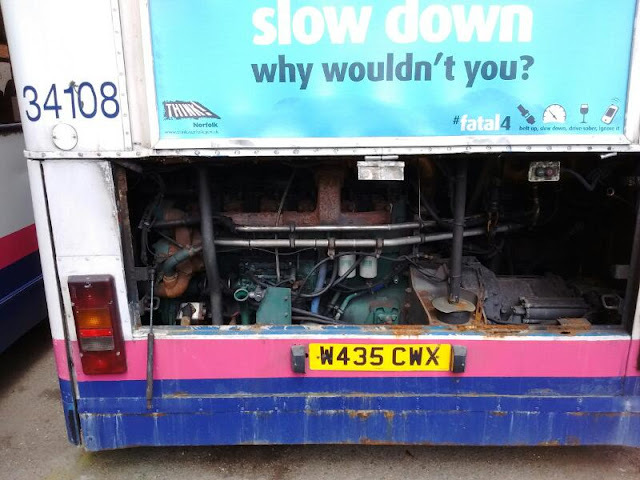 This left 33808 with the gearbox drive plates issue, it finally returned on 13th April and 33815 remained dumped on the forecourt at Vancouver Avenue until despatched to ZF on 13th. Here it was dealt with very quickly and was back on the road on Saturday 16th. 33818 was finally sent back to Lowestoft on 13th April which coincided with the completion of 33816's MOT. For three days the fleet was then at full strength but then 33807 was stopped for MOT and on 19th 33809 was taken off the road with a rear axle problem. This entailed a visit to Powertrain and a 17 day layoff, it finally returning to traffic on 6th May. He says "What in Heavens name is going on, we've just done a loop in Nestles access road and are now heading back to Weasenham Lane". Oh Dear !! Nice reflections Victor ! On Saturday 23rd April 33814 failed with a serious engine fault - its duty being taken over by 33810. 33814 was the subject of much investigation and eventually ended up at Cummins, not returning to traffic until May 16th. All this meant help was required and this arrived on April 24th in the shape of 33823 and this is still on loan as I write (May 30th). Not content with his unusual diversion seen above, Victor reports getting some more unusual route mileage on the X1 on April 26th : "This time we have turned left at the new A16 roundabout and are going into Peterborough via Welland Road St. Pauls Road and Lincoln Road !" 33815 didn't do a lot of work after having its gearbox repaired, firstly it was required for MOT and then on Saturday 30th April broke down at Peterborough with a failed injector. 33812 was sent to Wisbech to take up the diagram restarting as the 16.05 to Norwich. Later that evening, 33804 on the 20.30 from Peterborough had a window smashed by a pedestrian at Peterborough railway station. Some passengers gave chase and the delinquent was apprehended and handed over to the British Transport Police. Commendable stuff, but inconvenient and not nice for a lady who was showered with glass, fortunately without serious injury. 33810 was sent to the rescue. Some hard work by the King's Lynn engineering staff made sure a full compliment of vehicles was available for the run out on Tuesday May 3rd after the Bank Holiday. There was once again no spare bus though and when 33811 suffered a puncture while working diagram 6013 at King's Lynn bus station. The vehicle had to retire to the garage for a tyre change before chasing its diagram as the 14.41 King's Lynn - Norwich. 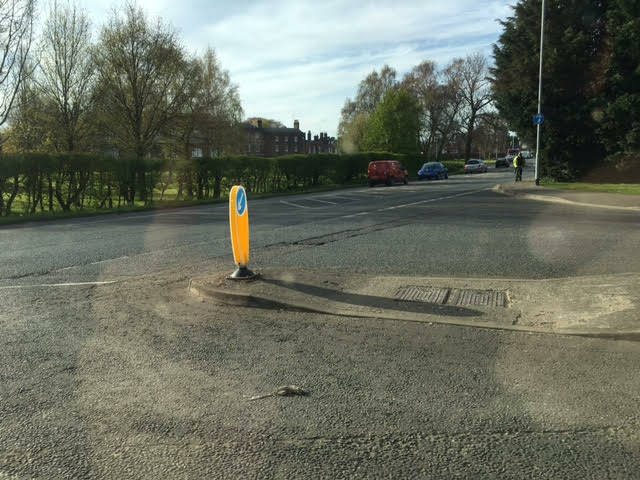 Wednesday May 4th saw more disruption due to a collapsed manhole near Swaffham. An example of late running was diagram 6009 with 33805 which was due off Wisbech at 10.14 to Peterborough, but which departed at 10.54. In addition many afternoon services were diverted via Wisbech St. Mary. Having had an injector replaced, 33815 was back in action on Friday 6th May, however, just as 33809 came back from attention to its gearbox, 33807 suffered the same complaint, coming off turn 6007 on Saturday May 7th and being replaced by 33823. With 33817 stopped for MOT, almost a week went by with no spare buses. Sunday May 8th provided a change. 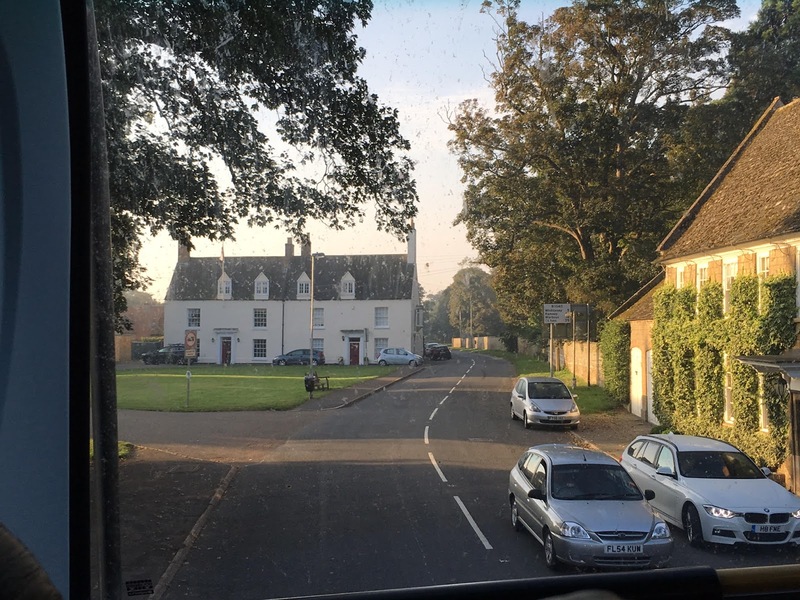 Cheryl sent me a text to say X1s were passing her house between Thorney and Whittlesey. They were indeed X1 buses, 33806/12/13 to be precise and they were on hire as rail replacement between Peterborough and Ely. The route from Whittlesey to Thorney does quite often see X1 services though when other roads are blocked locally. Yet another collapsed manhole caused problems on Thursday 12th, this time at Middleton, Bruce monitored proceedings and worst affected service appeared to be the 13.15 from Peterborough, diagram 6013 with 33811 which arrived at Walpole Highway at 14.35. Most buses were running 15-20 minutes late throughout the afternoon. 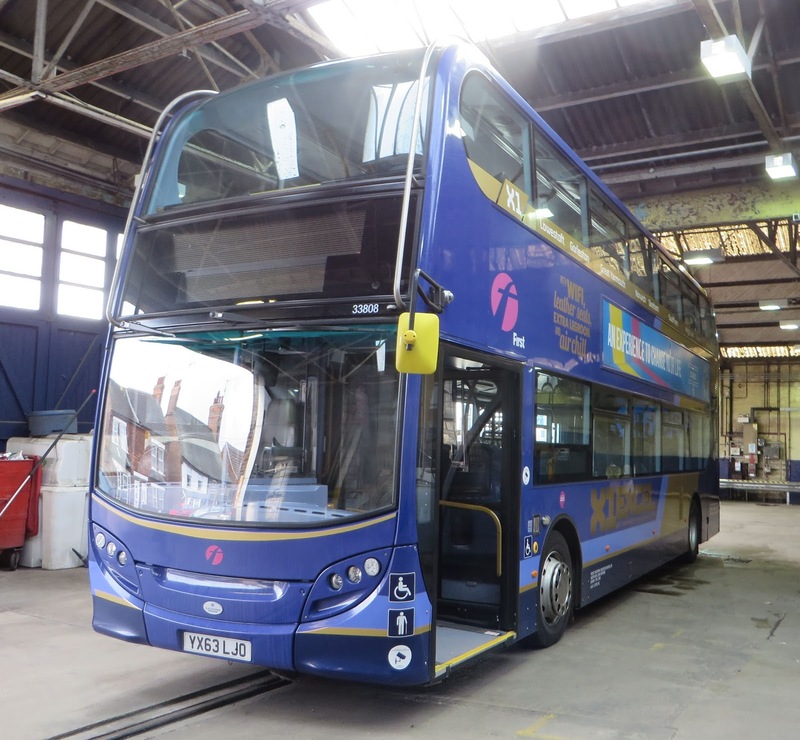 Having had its original MOT date postponed due to the bus shortage, 33808 was finally dealt with on Thursday 19th and was immediately returned to service. On this date it took over diagram 6007 from 33810 which was then sent away to have its gearbox looked at. It returned from Powertrain on 25th. So to Friday 20th May and where I first started this blog entry, 33803's engine went into meltdown while working the 15.15 from Peterborough and it finally expired at Walton Highway. 33815 took over the turn and 33803 is currently at Cummins being assessed. On 23rd, 33806 on diagram 6010 15.10 Norwich - Peterborough was halted at Dereham with an electrical fault. It returned to work on 27th May. A broken down car on Guyhin bank saw most services diverted again via Wisbech St. Mary on the afternoon of Wednesday 25th, although 33809 managed to use the normal route on the 14.24 ex Wisbech and 15.15 ex Peterborough, losing 18 minutes in the process. 33810 returned from Powertrain on 25th and 33813 immediately went west in its place to have its gearbox examined. Thursday 26th saw 33805 expire in Norwich with the oil cooler fault and 33814 was sent to Dereham to restart the service at 19.21. 33817 was also needing attention to its oil cooler on this date and it was taken off diagram 6008 and replaced by 33807. All the more surprising then after this catalogue of woes that the Friday before the Bank Holiday seems to have passed without a hitch and all services seemed to be running within 5 minutes of time - a situation almost unheard of on a BHF. Now then, well talk about things turning full circle ? Zak Nelson reports "Hi Gerard, Hope all is well! 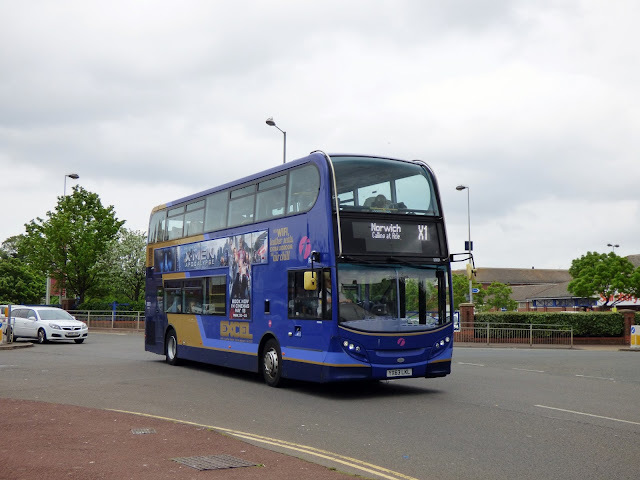 I've attached a photograph of ex-X1 coach 20501 AO02RBY which is now based in Great Yarmouth alongside sister 20500 AO02RBX. The interesting thing about this picture however is that it's been reunited with the X1! It's seen here working this afternoon at County Hall roundabout. I've also attached a photo of 33821 which has had the X1 part of the vinyl removed. It is believed but not confirmed that is to be replaced with new vinyls for the Eastern side of the route to include the new X11 Norwich to Belton service. Many thanks for those Zak - do you think we can get some western side vinyls for 33823 ? !! She's still in proper livery too ! 37578 (AU58EDJ) arrived at Gorleston Church at 14:32 so I am assuming its the 14:00 from Lowestoft Bus Station. This one shows 37577 (LK58EDF) on a southbound Bernard Mathews contract working - unusual to say the least! Both pictures taken on May 25th. Many many thanks to Roy and all who have contributed to this rather lengthy and overdue blog entry. I will try and make the next one a bit sooner ! 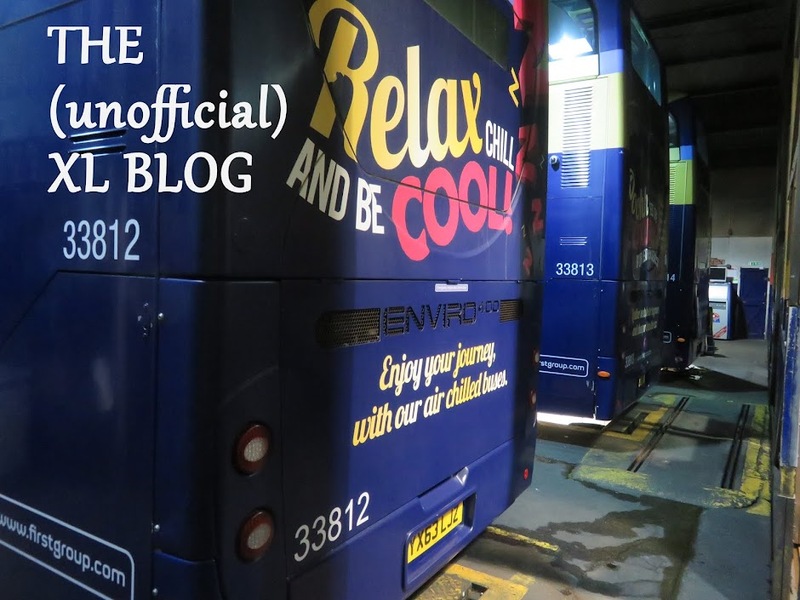 Monday 4th April 2016 ~ Who'd Run a Bus Service ? March was a very trying month for the operators of the X1 service. After a relatively quiet period for incidents on the A47 and fleet problems, March certainly gave those in charge a headache ! On Wednesday 2nd the service ran well with the exception of the 12.45 King's Lynn - Peterborough which turned up at Wisbech 24 late with 33811 only ten minutes before the next bus, 33817. This was a reaction to an earlier incident at East Winch. 33813 had its MOT completed on 3rd and returned to traffic on 5th whereupon 33805 was stopped for the same reason and this was back at work on 10th just a few hours after MOT completion. The evening of Sunday 6th saw two problems, firstly the 21.20 Peterborough - King's Lynn with 33811 suffered vandalism at Walton Highway when a window was broken. The bus eventually arrived in Lynn 35 minutes late. By coincidence at almost exactly the same time, 33809 failed at Honingham with a fuel problem on the 22.20 from Norwich and 33806 was sent out as replacement, although 33809 was resuscitated and got as far as Dereham, it was repaired at King's Lynn and managed to be back in service early next morning. On Thursday 10th, 33803 finished its duty and limped into Vancouver Avenue after which it shut down and was unable to be moved, this happened at the garage's busiest time and a queue of buses developed until eventually 33803 responded to treatment ! It was subsequently grounded until 15th while the fault was established and rectified. 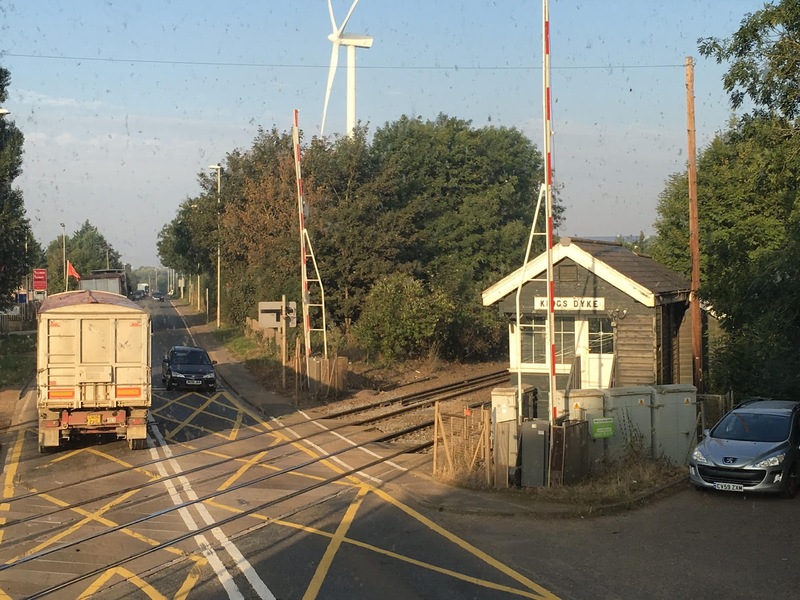 The morning of Friday 11th saw disruption on the Peterborough - Wisbech section after an accident at Eye Green. The 07.30 from Peterborough (33813) was 13 late from Wisbech and the next service due to depart at 08.55 arrived at 09.27 with 33812. Taking a double load of passengers the lateness had increased to 39 minutes at Walpole. The 08.35 from Peterborough ran 51 late and the 09.05 (33805) was 33 late into Wisbech. After this things quickly returned to normal. Monday 14th saw 33805 taken out of traffic and replaced by 33814 after becoming noisy. After inspection 33805 was eventually towed to ZF Powertrain at Willenhall for attention to its back axle. It was seen being hauled along the Wisbech bypass by Bruce at 09.30 on 16th. Back to the 14th and 33816 hit a stray dog at Thorney while working the 15.15 from Peterborough. After inspection at King's Lynn 33816 was able to continue in traffic. Another A47 accident on the Pullover Road west of Lynn caused delays on Thursday 17th. The 07.15 Swaffham - Peterborough (33812) left Wisbech 23 late as a result, but a swift turnaround at Peterborough saw it arrive back in Wisbech at 10.26, just a minute after its scheduled departure time eastbound. Other services seemed unaffected. Late on the evening of 17th, 33804 failed just after leaving Peterborough with the 23.30 back to King's Lynn. Fitters attended and were able to get the bus back home. It had a fuel fault and was back in traffic two days later. By Sunday 20th, 33806 was stopped for MOT work and with 33805 still away at Powertrain, 33818 was summoned from Lowestoft to assist in keeping the passengers moving. Monday 21st began with 33818 in action working the 07.15 Swaffham - Peterborough, however, this was not to be a good start to the week and a three vehicle accident near Thorney caused havoc with some services taking the Thorney to Whittlesey route to avoid the obstruction. After the 08.20 service to King's Lynn left Wisbech on time, the next eastbound X1 was 33808 at 09.45 and then 33803 at 09.58 and 33804 at 10.12. The latter had borne the brunt of the delays and was actually the delayed 08.55 departure ! 33818 came back 26 late and then the service got back to normal with 33811 at 11.27 (37 late) and followed by 33807 at 11.29 (9 late). All this had a chaotic effect on positioning of buses and drivers and it was amazing how the service returned to being punctual. Thursday 24th was predictably busy being the day before the Easter holiday and during the afternoon an accident on Guyhirn Bank with a lorry and three cars affected the X1. The 14.54 Wisbech to Peterborough with 33807 departed 15 minutes late and left by its normal route, however, it did a U turn at Cromwell Road roundabout and by 15.32 it was back in Wisbech to take the diversion via Wisbech St. Mary Even more unusual was the route of 33815 on the 14.15 from Peterborough which ran via Wisbech St. Mary but then encountered a further blockage in Wisbech Old Market, enterprisingly the driver took the route over Town Bridge and took the tight left turn to resume the normal route past the Clarkson Memorial down Nene Quay. This is the first time I have seen this manoeuvre attempted ! 10.05 ex Norwich 33815 11 late, 11.05 ex Norwich 33806 46 late, 12.05 ex Norwich 33811 24 late and 13.05 ex Norwich 33818 19 late. Going east the 11.05 from Peterborough was 33814 running 37 late, the 12.05 ex Peterborough was 33804 34 late and suggesting that 33806 terminated at Wisbech it returned on the 14.05 from Peterborough just 4 minutes late. All observations made near Walpole Highway. Very unusually on Easter Sunday and Monday the same six buses were out on the road, these being 33804/10/11/13/15/17. On 26th 33806 was stopped with an alternator problem but it was back in use on 30th, while 33805 arrived back on 31st and plans were made to return loan vehicle 33818 to Lowestoft, however, the best laid plans and all that. 33808 decided to play up. It was taken on a test run and lost all power on the A47 Tilney bypass. It was collected from this point and carted off to ZF having the gearbox drive plates problem. This is surprising as all the fleet have had remedial work carried out to prevent this. So 33818 is still with us as I write and 33809 is now being prepared for its MOT. All this has rather overshadowed the announcement of the changes to the western section of the service taking place from 17th April. The opportunity to again provide a regular interval weekday evening service has again been passed over and instead the 20.20 departure from King's Lynn will now terminate at Wisbech, which sounds guaranteed to provide some fun. The evening departures from Peterborough will now be at 19.30, 20.30 and 22.30. The 22.30 departures from Norwich and Peterborough will be the last two arrivals in King's Lynn at around midnight. On Sundays the late evening service is completely withdrawn and the last two services into King's Lynn are the 20.05 from Peterborough and 20.20 from Norwich. The latter is the last arrival at King's Lynn at 21.46. Nearly managed to miss a calendar month without an update, but hey we don't get February 29th every year so let's get on with it. 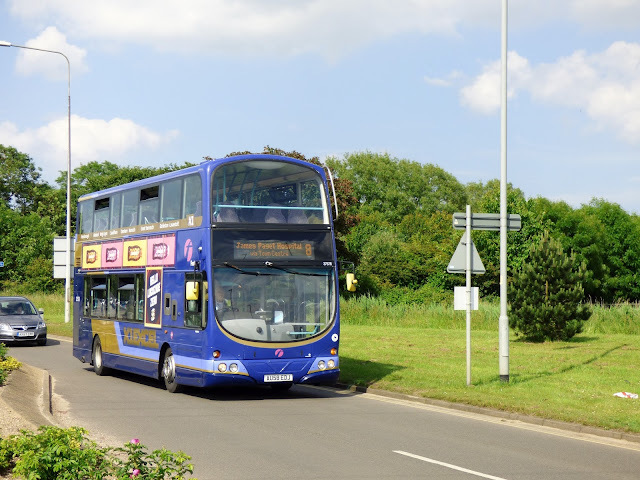 I recently had a trip to Norwich on the X1 at the invitation of our old friend Victor Meldrew. I already had a Western Ten trip ticket, so it just meant buying a Dereham to Norwich day return to fill the validity. It did make me wonder how many people actually do this, as the driver seemed very surprised when we went downstairs at Dereham and explained the circumstances. Nevertheless, we had a good day and I took the opportunity to take some photographs from upstairs of passing services. Apparently consideration is being given to abandoning the 5 year rolling replacement programme and the current fleet may be replaced after 4 years. 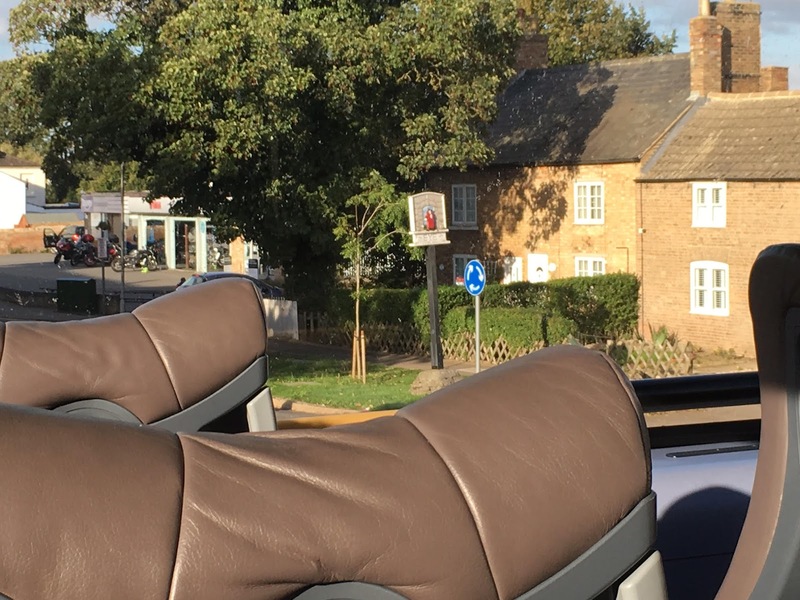 Among the options being discussed are a new fleet of coaches with extra capacity for use on the western section, while existing vehicles may remain on the Norwich - Lowestoft leg. This is all very uncertain though and planning is at an early stage. MOT's have started on the King's Lynn Enviros although the plans were disrupted when the first candidate, 33803, was away for repairs when it was due, so 33804 took its place. In fact 33803/6 were both away for repairs at Cummins and Full Circle, so this saw the temporary loan of Lowestoft's 33819 to cover the shortfall. 33803 was absent from 29th January to 12th February after sustaining a severe oil leak and 33806 which had been involved in a scrape with an errant car was out of service between January 23rd and February 4th. 33819 arrived to help out on January 28th and returned home after use on 11th February. 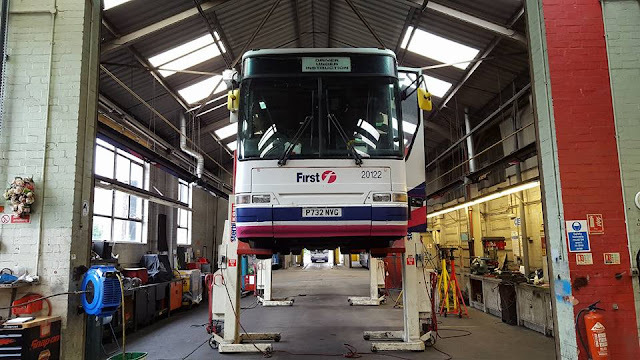 The MOT on 33804 took place between 7th & 10th February. 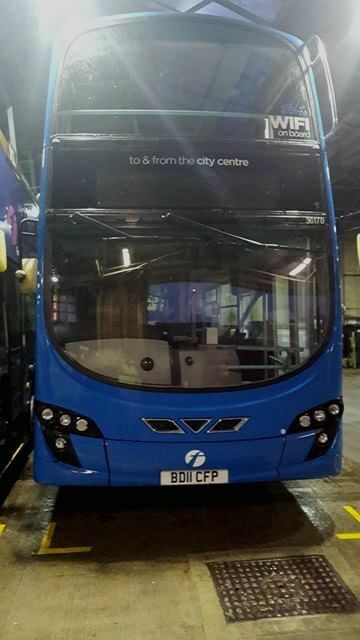 Zak Nelson reports that the Lowestoft fleet of Enviros has at last received vinyls stating ' Cared for by the Lowestoft depot team' which is good to hear. We were just approaching Walton Highway having left the B198 when we encountered 33806 heading for Peterborough on the 06.45 from Norwich, the first westbound through service of the day. The new King's Lynn Interchange with 33817 occupying the X1 bay with the 09.35 Peterborough departure (07.45 ex Norwich). Conflicting arrival times mean some services have to use alternative bays as seen here. Necton and 33812 with a cheery wave from Wyn arrives on the 09.15 from Norwich. The 08.05 from Peterborough which I was on with 33816 is booked to pass this service at 10.14 here so the timetable was running well to schedule. Having just left Easton and rejoined the A47, 33813 passes by on the 10.30 Norwich - Peterborough X1 and another wave from GH, we are doing well ! Shortly after leaving Norwich 33815 heads for Dereham on the 11.00 Norwich - Peterborough. Last one for now and contrasting liveries on former X1 Geminis. 37573 nearest the camera is in new Excel livery with a connecting X1 to Lowestoft, while 37569 in the distance is ready to leave on the direct service X2.